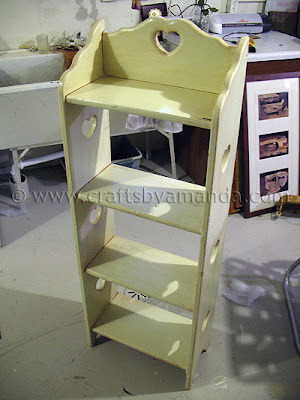 Do you remember those wooden shelves with the heart cut outs on them? Perfect for the country blue decor that was so popular in the 80’s and 90’s? 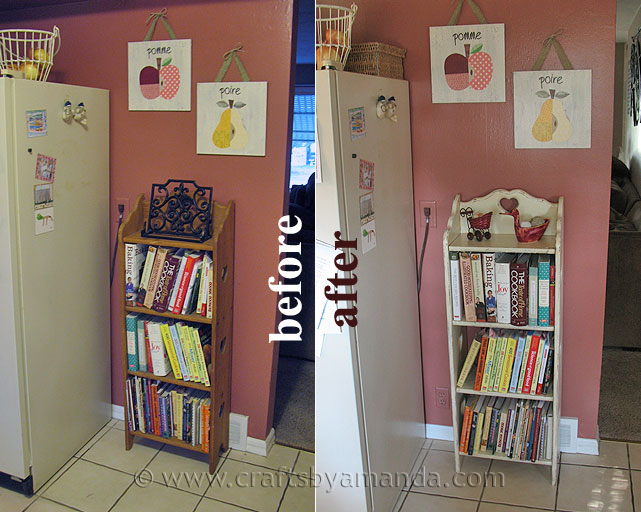 Well last summer I picked up two of those type of bookshelves last summer at a garage sale for $1 each. 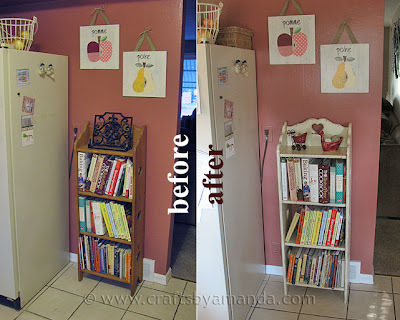 I’ve been using one of them for cookbooks in my kitchen, but the color has been driving my crazy. I’ve been wanting to revamp it for months and finally pulled out the paintbrush and sander last week. 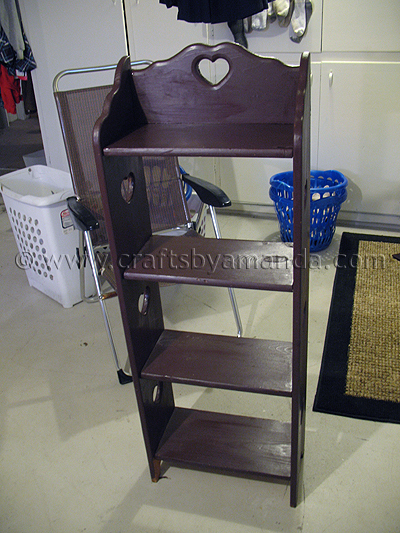 I started by sanding any rough edges, then painted the entire thing with a coat of Dark Walnut. Then I added some Royal Burgundy in random areas. 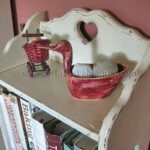 The reason I did this is I wanted some red and some brown to show through after painting the white layers and then sanding. After those coats dried, I painted the entire thing with 3 coats of Soft White. I probably could have gotten away with two, but I really wanted to make sure I had a solid white coat to work with. Next I mixed some Americana Light Cinnamon with some staining/antiquing medium . I did wait a day before doing this to make sure the white was good and dry. With antiquing medium to apply it with a brush or rag, then wipe off the excess with a dry cloth. This is the stain being applied, work only in sections or it will dry too much to wipe off! This is what it looked like after all the stain was applied and wiped off. 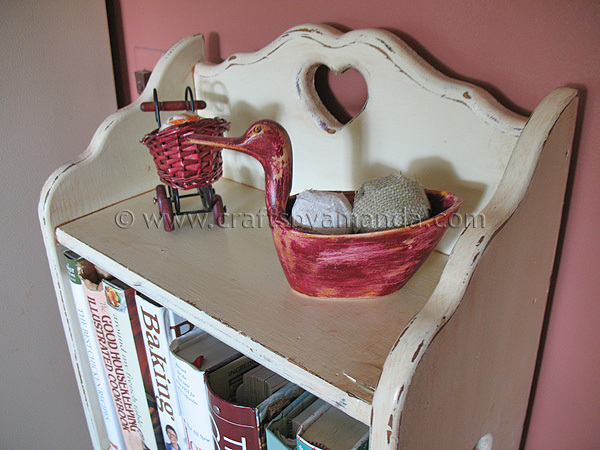 When that was dry, I used my handy dandy Ryobi sander to sand the edges and give it an aged look. I paid special attention to the corners. 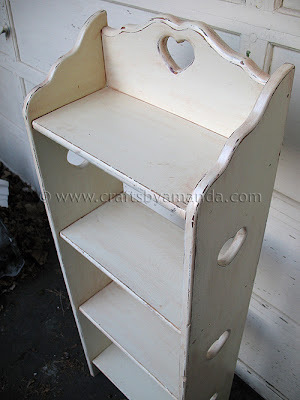 After those coats dried, I painted the entire thing with 3 coats of Soft White. 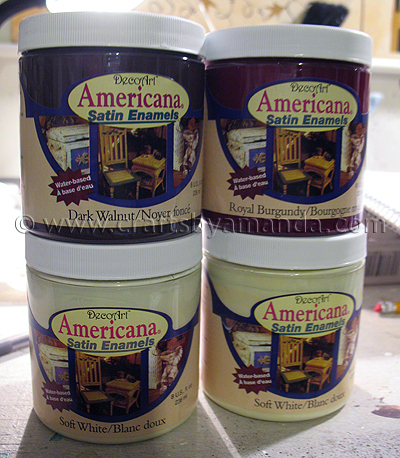 Next I mixed some Americana Light Cinnamon￼ with some staining/antiquing medium￼. I did wait a day before doing this to make sure the white was good and dry. With antiquing medium to apply it with a brush or rag, then wipe off the excess with a dry cloth. 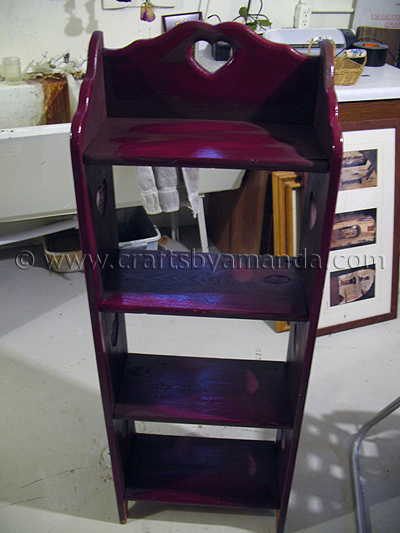 When that was dry, I used my handy dandy Ryobi sander￼ to sand the edges and give it an aged look. I paid special attention to the corners.When finished, I used a matte acrylic spray sealer and let it dry overnight before adding any books. 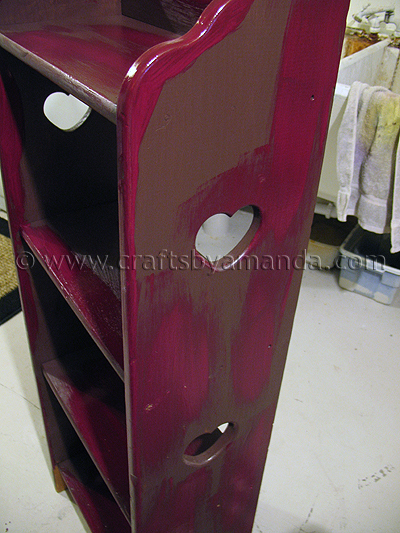 The shelves look great, the hearts look great with a fresh pop of paint! HAHA! I have a whole HOUSE full of those — floor shelves, book cases, bench, tables! I've hidden most away but I too am thinking of at least painting a few of them. Love the technique you used with all of the different colors. I too want to cover the hearts and I'm thinking some wooden 'medallions' might be the answer but yours DOES look perfect as is! Thanks for the detailed instructions! It is so much better, it is really cute! Thanks for the ideas! Luv luv it thank you for the step by step pics. I need to get some paints. Really cute Amanda! I, for one, am glad you left the hearts. With the new paint technique, you've really updated the look!